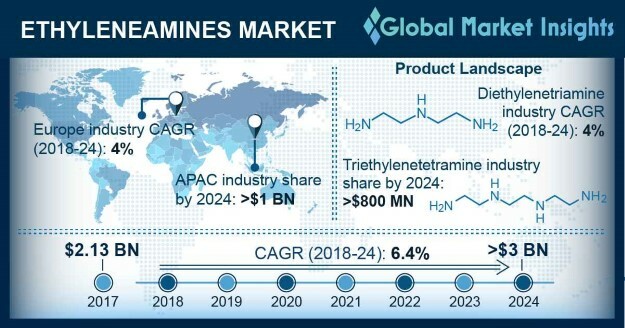 Ethyleneamines Market size is set to surpass USD 3 billion by 2024; according to a new research report by Global Market Insights, Inc.
Ethyleneamines are instable molecules which have ability to alter properties of a wide range of chemical products. They can make them firmer, softer or more flexible, make them stick better or stop them from clotting. Growing investment in R&D and technological advancement by manufacturers will drive ethyleneamines market size. Rising demand for ethyleneamines in different application segments including coating, textile, surfactants, lube and fuel additives, and asphalt additives will drive industry growth. Manufacturers are involved in strategic expansion through partnerships and mergers & acquisitions to increase their market share, profitability, product portfolio, production capacity, and geographical presence which is positively favoring product demand. France diethylenetriamine industry size is estimated to surpass USD 20 million by 2024. Rising awareness of probable side-effects owing to numerous artificial substances utilized in personal care and cosmetic products will upsurge consumer inclination to accept organic and natural products which would boost ethyleneamines market growth. Production of ethyleneamines is highly reliant on raw materials including ethylene dichloride and ammonia. Sourcing of raw materials, risk of procurement, and transportation owing to stringent government regulations possibly may hamper industry profitability, thereby affecting ethyleneamines market price trend. Diethylenetriamine industry size from polyamide resin application may exceed to USD 40 million up to 2024. They are widely used as binders in printing inks for flex gravure application on certain substrates including metal, leather, and plastic. The product is also utilized in manufacturing abrasion-resistant, glossy and over-print varnishes, thus driving ethyleneamines industry growth. U.S. triethylenetetramine industry size from corrosion inhibitors application is estimated to surpass USD 13 million by 2024. The reaction of triethylenetetramine and diethylenetriamine with fatty acids produce substituted imidazolines and amidoamines, which are utilized as corrosion inhibitors in petroleum production operations which may positive impact on industry growth. Ethyleneamines industry size from ethylenediamine is expected to witness strong gains up to 4% in the projected timeframe owing to wide utilization in various industries including detergents, textile, and agriculture. Ethylenediamine has lowest molecular weight and appears as a colorless liquid. It is a versatile & highly reactive molecule and are utilized for making polymers that serve as drainage aids thus, stimulating product demand. Diethylenetriamine market size from personal care application may witness strong gains up to 4.5% in the projected timeframe. Rising demand for organic skin care products along with strict adherence to packaging, quality, and good shelf-life will propel industry demand. Personal care is a major end-use industry for the product owing to its properties of keeping skin soft and youthful, moisturizing, and healing support to the skin. It is highly water-soluble and used in soap and detergents hence, driving ethyleneamines market growth. Global ethyleneamines industry share is moderately consolidated and competitive with some of the key manufactures which includes AkzoNobel, Gem chemicals, Huntsman Corporation, Prasol Chemicals, Lanxess, BASF SE., Saanvi Corp, and Dow Chemicals. Firms are entering into strategic alliances including partnership, joint ventures to expand their regional presence and product offerings which is likely to favor industry growth.